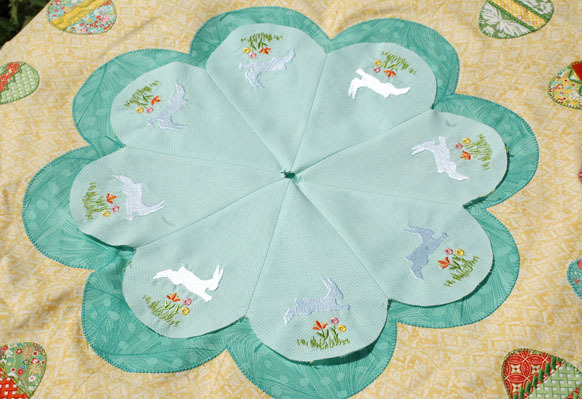 Are you ready to add the central flower-shaped motif to your Easter Table Topper? 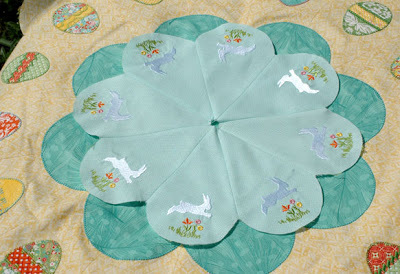 The flower will have Inner and Outer Petals and we will applique a big bunny in its center! You’ll need about 1/2 a yard of fabric each for the for the Inner and Outer Petals and a 6” square of white fabric for the Bunny. 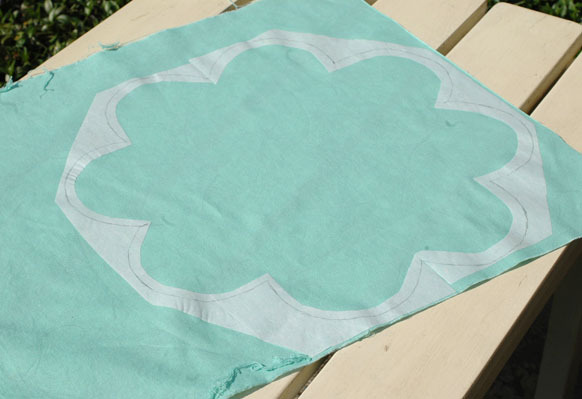 First, print out this Outer Flower Template 4 times and tape it together on the dashed lines. 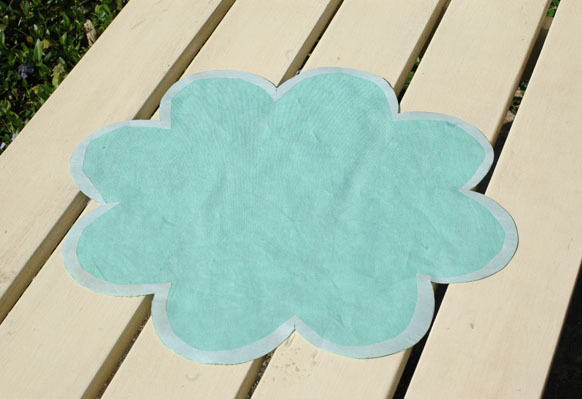 Trace the big flower shape onto paper-backed fusible web. (I used Steam-A-Seam-2 by the Warm Company. If you only have some narrow fusible web you might have to trace it in two halves and that is okay.) 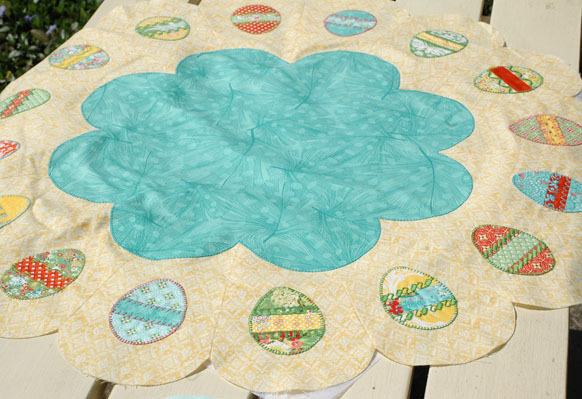 Cut out the excess fusible from the center of the shape (there will be a lot and you can use it for another project!) and fuse the remainder onto the wrong side of your Outer Petal fabric. My Outer Petal Fabric was a lovely feather design in a teal color from Flora, by Lauren and Jessi Jung for Moda. (It looks lighter on the back.) Cut out flower shape along the drawn lines. Remove paper and center on your Table Topper, using the seam lines as guides. Fuse. Back with one layer of stabilizer (I used Sulky Tear-Easy) and buttonhole stitch around the entire flower shape to secure. (I used Aurifil 12 wt. cotton thread in 1148 teal.) DO NOT tear off the stabilizer! 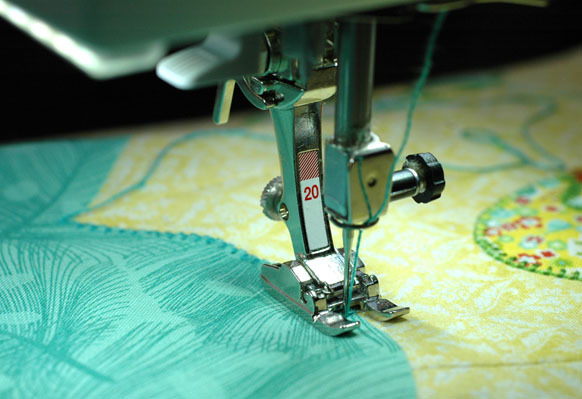 One note about applique stitch. I like to use a buttonhole-style applique stitch with a 12, 24, or 30 weight contrasting thread in many of my applique projects. (I use a 50 wt. cotton in the bobbin.) My favorite is stitch #1329 on my Bernina. I loosen the top thread tension considerably. You have two options for the Inner Flower shape. If you have an embroidery machine I have designed a hopping bunny embroidery pattern to stitch on each petal of the flower! To do this, you will actually be stitching out more Dresden Plate blades using your embroidery machine, cutting them out, and assembling them as you did the egg pieces. 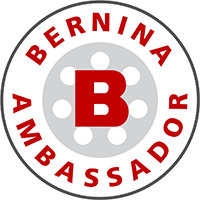 Eventually this design will make its way to the Bernina site, but in the meantime, feel free to post a message (not anonymously) with the type of file you need at the end of this post and I will email you an .EXP or other type of file. 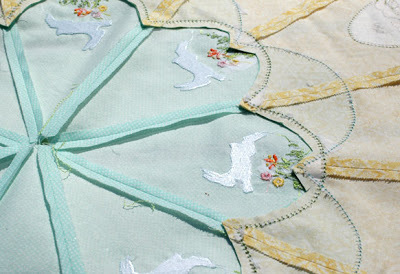 To make the embroidered Inner Petals stitch out the bunny plates 8 times on your Inner Petal Fabric. I used a pretty small scale light aqua dot print from Ruby by Bonnie and Camille for Moda. Start at 1 end of the 1/2 yard cut and work your way down, rehooping for each plate. This allows you to get the motifs pretty close together. 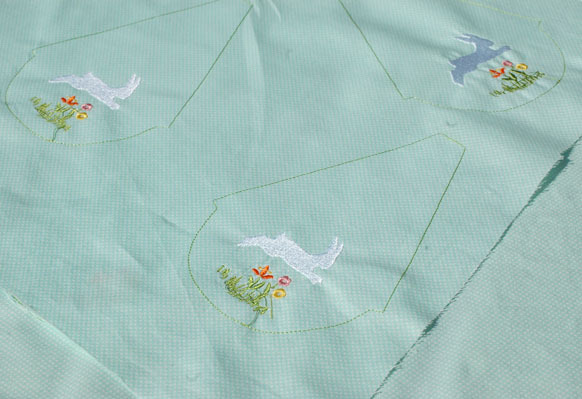 You can cut off embroidery pieces as you work your way down the fabric. I used two layers of Sulky Tear-Easy and an array of threads I had on hand: Sulky 40 wt. rayon in 1001 white for the bunny and 1332 green for the grass, Madeira 1965 orange and 1683 yellow for two of the flowers, and Brother 079 Polyester for the third. Once you are done clip the threads and cut out your plates along the stitched lines. Sew together plates using a 1/4” seam allowance, back stitching on both ends. Press seams open. Spray adhesive on the back and center on the Outer Flower Border shape. (You can also pin or baste or use a fabric glue stick.) I originally designed this Inner Petal shape to be centered in the Outer Petal shape like this…. But once I was actually making the project I preferred the look that resulted when I offset the placement of the Inner and Outer Petals. Use a buttonhole stitch around the entire Inner Petal shape to secure. (I used Aurifil 12 wt. cotton thread in 1114 green.) Tear off stablizer and cut excess fabric from behind the Inner Petals, being careful not to clip the Inner Petals themselves! If you don’t have an embroidery machine you can still make the table topper! Use this template to print out the Inner Petal Shape. 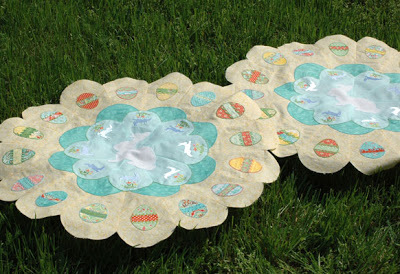 Tape the shapes together along the dotted lines and trace onto paper-backed fusible web. Cut out the excess fusible from the center of the shape and fuse the remainder onto the wrong side of your Inner petal fabric. Cut out. Remove paper and center on your table topper. Fuse. Back with stabilizer and buttonhole stitch around flower to secure. Tear off stablizer and cut excess fabric from behind the Inner Petals, being careful not to clip the Inner Petals themselves. Now it is time to add your bunny! Trace this template onto paper-backed fusible web. If your are sewing the non-embroidered version you might want to enlarge the printout to 120%. Cut out the excess fusible from the center of the shape and fuse the bunny shape onto the wrong side of your outer white bunny fabric. Cut out. Remove paper and center on your Table Topper. Fuse. Back with stabilizer and buttonhole stitch around the entire Bunny to secure. (Again, I used Aurifil 12 wt. cotton thread – this time in 2024 white.) 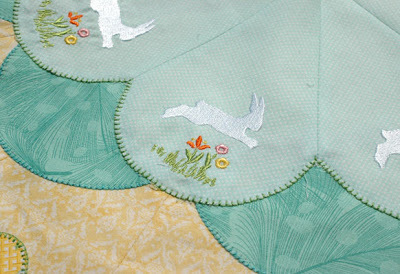 Tear off stablizer and cut excess fabric from behind the Bunny, being careful not to cut him!. That is it! If you just can’t wait to get a start on finishing this topper the next step will be layering it on top of backing fabric and batting and quilting as desired. Previous post: Available on newsstands now…. What a cute topper. Could I have the designs please in VP3 format. I should have just enough time to get this done by Easter. I don't have an embroidery machine, so I'll come up with something else to go on those petals….hmmm, the gears are turning. Your table topper is awesome Amanda. I eally love the eggs and you are SO correct about all the neglected fancy stitches on our machines. I do not use them near as often as I should. I would love your design. Thank you for the generous offer. If you can, I use the .vip format altough I can convert almost all others except .art. My first choice is .vip, then .pes or .jef. Anyway, thank you again for the awesome table topper and design offer. Super, super gorgeous, Amanda!! I love every piece of this beautiful topper so far – and just know I'll love the rest. 😉 I also appreciate your offer of your hopping bunny embroidery. If you could send me a .pes of it, I would be ecstatic. I can't wait to my topper on the table for Easter!!! Marianne, please leave me your email so I can send you the file! thanks for such a cute topper. I have been working on two … just because I guess. 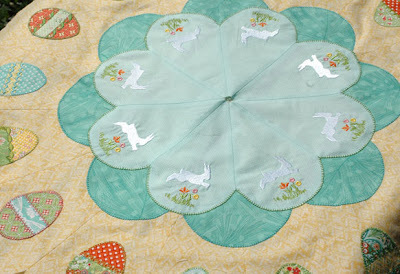 I have a brother machine and I think it is a PES format that I would use to stitch out the bunnies. This is just awesome and so different I love it….. I absolutly love this. I need Art for the embroidery. Just stunning! your directions are very clear and easy to follow – thanks for sharing – Can you please send me art format for the embroidery? Thanks again!! Will definetly make for next year since I just found it today! I woul dlove the design in ART. I am in love with this table topper. It may not be on my table this year but surely next. I would like the bunnies in Pes format if possible. Beautiful ! This is a beautiful topper. I'd love to receive the embroidery design in Art format (Bernina 830LE). Love it and will make it for next Easter. 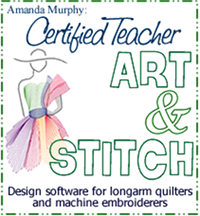 Would love to have the embroidery design, please! Thank you and sorry for the inconvience. Sorry thought you would get the email addy:) Technology is So much fun sometime:) hahaah!!! I forgot to tell what type of machine I have it is a bernina 200 Art4 files. Kathleen, leave me your email address. Thanks! This Easter topper is awesome. Please send me the patter in Art 4 format. Thank you so much! I just found your blog site and love the easter table topper. Would you please send me the design in exp format. I have a 630E machine and use artlink to send to my machine. I just found your blog. Your Easter table topper is darling!! I can't wait to start one. Please send the design in exp format… for 640E. Thank you!! I just found this also. I would love your bunny embroidery pattern in either art or exp. I love this. Your directions are wonderful. What a lovely table topper! I do a lot of wool applique, but I would attempt this because of how beautiful it is! I would love to get the embroidery of the jumping rabbit. I have a bernina, so ART format would be great. Thanks in advance. 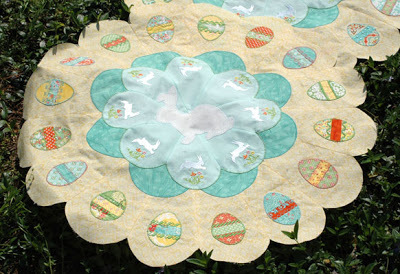 I love your Easter Bunny table topper. I will have to make it for Easter next year. Could you please send me the embroidery file for the little bunnies. My email address is vcanham@aol.com. I have a Bernina, so I believe that is an .art file. Hi Amanda, I've probably done something wrong because I see my post not appear. I am also loving your Easter topper. 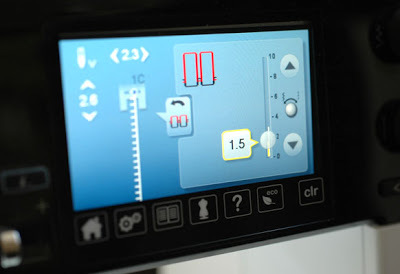 I'd love to receive the embroidery design in Art format for my Bernina 830. Thank You. Hi my name is Marcia. Could you please email me the embroidery design for the rabbit. Email address is sewingmomm@sbcglobal.net. I would like th have the format in VP3,I guess my next choice would be PES but I can convert just about any format with my software. Hi.. Thanks for offering the adorable design! Could you please send me a copy of the hopping bunny in .ART format. ? Thanks again! 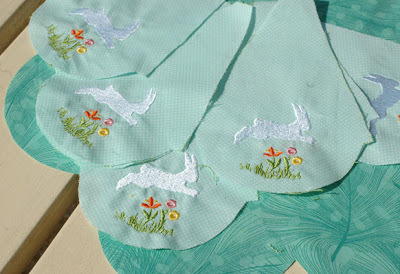 Please send me the jumping rabbit design in art for my bernina 830 and in hus for my pfaff.